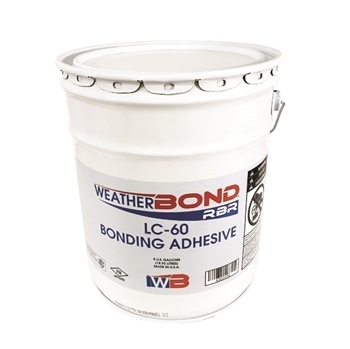 Carlisle WeatherBond LC-60 Bonding Adhesive is a high strength solvent-based contact adhesive that allows quick bonding of cured flashings and membranes to various substrates. It is a synthetic rubber adhesive formulated specifically for application with a 1/2" (13 mm) medium nap roller with enough versatility in the tack time of the film to allow large areas to be coated and adhered at one time. Carlisle WeatherBond LC-60 Bonding Adhesive is designed for bonding Carlisle WeatherBond RBR Membranes, Butyl and Epichlorohydrin membranes to various substrates. MIXING: Stir thoroughly until all settled pigments are dispersed and the cement is uniform in color. Minimum five (5) minutes stirring is recommended. COVERAGE RATES: Carlisle WeatherBond LC-60 Bonding Adhesive - 60 square feet (56 sq m) per gallon (finished surface). Porous surfaces and substrates may require more bonding adhesive than the typical coverage rate. APPLICATION: ** 1. The surface, on or against which adhesive is to be applied, shall be clean, smooth, dry, and free of fins, sharp edges, loose and foreign materials, oil and grease. Depressions greater than 1/4" (6 mm) shall be feathered, using epoxy, mortar or other approved patching material. All sharp projections shall be removed by sweeping, blowing or vacuum cleaning. 2. After thorough stirring (minimum 5 minutes), apply Bonding Adhesive to substrate and membrane using a 9" (230 mm) wide ½” (13 mm) medium nap roller. Application shall be continuous and uniform avoiding globs or puddles. An open time of 5 to 50 minutes is recommended before assembly. Bonding Adhesive must be allowed to dry until it does not string or stick to a dry finger touch. Any coated area that is rained on should be allowed to dry and then recoated. Do not apply Adhesive to splice areas. 3. Mate the membrane with the adhesive-coated substrate while avoiding wrinkles. Immediately brush down the bonded portion of the sheet with a soft bristle push broom or a clean dry roller applicator to achieve maximum contact. In some applications, swelling of the membrane may occur initially, but this will disappear after several days' exposure. Do not re-broom membrane in an attempt to remove swelling. * General properties. Typical properties and characteristics are based on samples tested and are not guaranteed for all samples of this product. This data and information is intended as a guide and does not reflect the specification or specification range for any particular property of this product. ** REVIEW CURRENT SPECIFICATIONS AND DETAILS FOR SPECIFIC APPLICATION REQUIREMENTS. Carlisle WeatherBond LC-60 Bonding Adhesive is a high-strength solvent-based contact adhesive that allows quick bonding of EPDM membrane to various substrates. It is a synthetic rubber adhesive formulated specifically for application with a 1/2" medium nap roller with enough versatility in the tack time of the film to allow large areas to be coated and adhered at one time. Covers about 60 square feet per gallon.